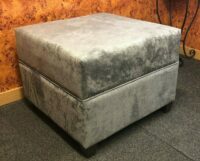 Buying bedroom furniture from Simply Chaise is adding style and comfort to your home. Our range of headboards create an attractive focal point for bedrooms, prevent marks and stains on walls and provide comfortable back support for when you are sitting. 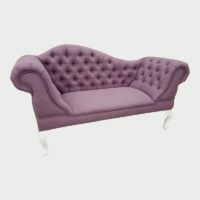 As a market leader in chaise longue supply, Simply Chaise is known for its diverse selection of tastefully curated furniture. 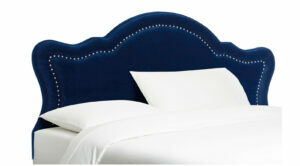 Adding bedroom furniture to our range, we provide the most discerning clients with premium bespoke headboards. We ensure client comfort and satisfaction by using high-quality fabrics and materials for our headboards. Made by our highly skilled and dedicated craftsmen, our bedroom furniture for sale is finished to the highest standards. 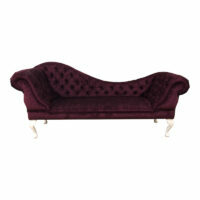 Simply Chaise offers sophisticated pieces of bedroom furniture that are a cut above the rest. 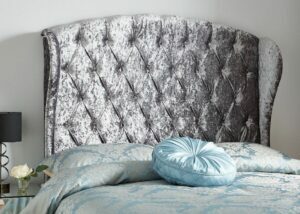 Our designer headboards come in lush textiles and tasteful designs. From timeless contours to contemporary shapes, there is a style for every taste. 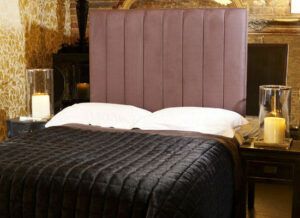 Our headboards are hand-finished by skilled upholsterers who have a keen eye for detail. Our range includes standard UK sizes, including Super Kingsize dimensions. We take out the anxiety of waiting for furniture to be delivered. We only use a trusted national courier that leaves a note including their contact number when they find that you are not present to receive the item. Please note though we aim to prevent this scenario by emailing clients to inform them of the delivery date, which then allows them to change the schedule if need be. Our range of furniture is already available at exceptional rates but if you decide to purchase more than one item from us, you will be awarded a P&P (post and packaging) discount. Creating luxurious bespoke bedroom furniture, we endeavour to handcraft your headboard and dispatch it within 3-4 weeks of confirming your order. 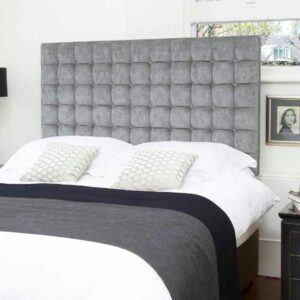 4ft6 Double thickly padded Designer Headboard - chrome studded border. Height;- 35 inches high above your mattress. 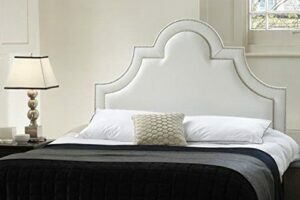 Balmoral 6ft Super Kingsize thickly padded Designer Headboard - chrome studded border. Height;- 27 inches high above your mattress.